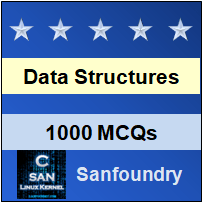 This set of Data Structures & Algorithms Multiple Choice Questions & Answers (MCQs) focuses on “Self Organizing List”. Explanation: Linear search in a linked list has time complexity O(n). To improve the efficiency of the linear search the self organizing list is used. A self-organizing list improves the efficiency of linear search by moving more frequently accessed elements towards the head of the list. 2. Which of the following is true about the Move-To-Front Method for rearranging nodes? Explanation: In Move-To-front Method the element which is searched is moved to the head of the list. And if a node is searched even once, it is moved to the head of the list and given maximum priority even if it is not going to be accessed frequently in the future. Such a situation is referred to as over-rewarding. 3. What technique is used in Transpose method? Explanation: In Transpose method, if any node is searched, it is swapped with the node in front unless it is the head of the list. So, in Transpose method searched node is swapped with its predecessor. Explanation: Worst case occurs when the element is located at the very end of list. So n comparisons must be made to the locate element. So the worst case running time of linear search on self organizing list is O(n). 5. Which of the following data structure is preferred to have lesser search time when the list size is small? Explanation: Self-organizing list is easy and simple to implement than search tree and it requires no additional space. So using self organizing list is preferred when list size is small. 6. In _____________ method, whenever a node is accessed, it might move to the head of the list if its number of accesses becomes greater than the records preceding it. Explanation: In the count method, the number of times a node was accessed is counted and is stored in a counter variable associated with each node. Then the nodes are arranged in descending order based on their access counts. And the node with highest access count is head of the list. Explanation: Self organizing list allows fast sequential search and it is simple to implement and requires no extra storage. Self-organizing list is used to implement the symbol table. 8. Which of the following method performs poorly when elements are accessed in sequential order? Explanation: Move-to-front method performs poorly when the elements are accessed in sequential order, especially if that sequential order is then repeated multiple times. Explanation: The self-organizing list rearranges the nodes based on the access probabilities of the nodes. So the required elements can be located efficiently. Therefore, self-organizing list is mainly used to improve the average access time. 10. Which of the following is not the rearranging method used to implement self-organizing lists? Explanation: Least frequently used is a buffer replacement policy, while other three are methods to reorder the nodes in the self-organizing lists based on their access probability.